This is an absolutely marvellous disc which is going to put a lot of collectors in a bit of a dilemma. 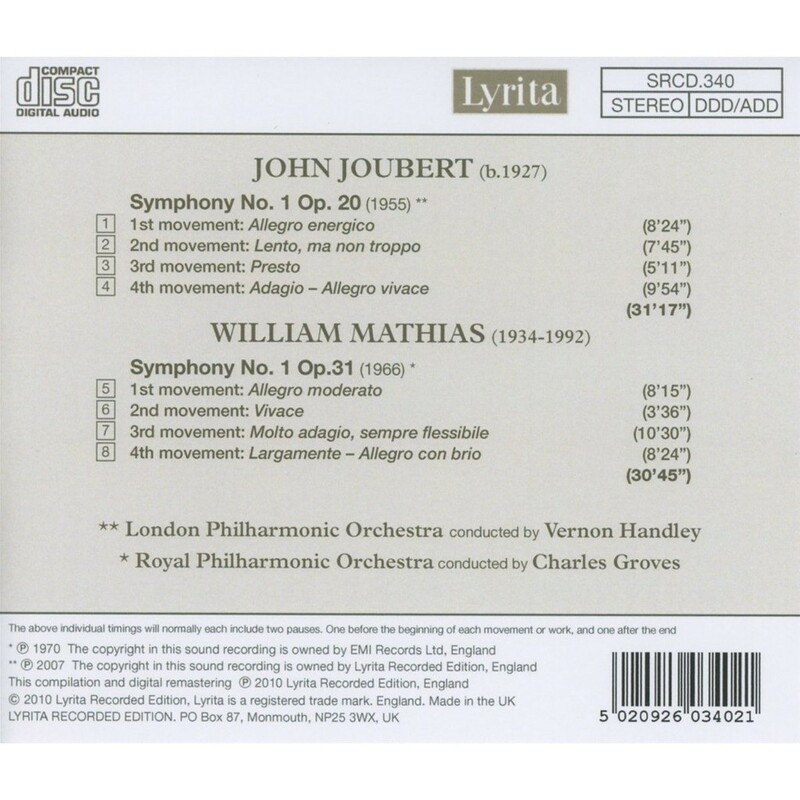 If like me, you snapped up this version of the Joubert Symphony No.1 when it first appeared as that rare fish, a Classical CD ‘single', you will be wondering whether the performance of the Matthias will justify the duplication – I would say wholeheartedly it does. If by happy chance you missed the disc in its first incarnation hesitate no longer and grab it while you can. As well as the quality of the music performed here it serves as a powerful testament to the work of two of the best yet relatively under-appreciated British conductors of their respective generations; Sir Charles Groves and Vernon Handley - was ever a knighthood more deserved for service to the Arts in Britain? John Joubert's music is gradually receiving the recognition (in the recorded catalogue at least) that it richly deserves. The performance of the symphony here was released as part of his 80 th birthday celebrations in 2007 and proves it to be both instantly accessible yet also profoundly rewarding on deeper acquaintance. Joubert contributes his own fascinating liner note and although he rather self-deprecatingly calls it ‘very much a youthful work' he also acknowledges that it ‘represents my coming of age as a composer'. Coming back to the work I am struck all over again by the compact power and economy of Joubert's writing. Not that this is dry in any sense but it has control of its material and avoids the verbosity that afflicts many early efforts at extended composition. Joubert states that it is scored for a classical orchestra but the presence of heavy brass, piano and percussion assures that the sound world it occupies is very recognisably post-War British. The disparaging phrase ‘Cheltenham Symphony' that was coined to intellectually bin any work giving even a passing nod to tonality from the 1950s through to the late 1970s would certainly apply here but I feel that is a badge it should wear with pride. As one would expect in an early work some of the composer's influences and enthusiasms have not yet been totally assimilated into a unique compositional voice but again I would say so what. I enjoy hugely the Sibelian granitic climaxes such as track 1 5:10. I wonder if this control of form had anything to do with the fact that Joubert conducted some of the rehearsals of the – mainly amateur – orchestra in preparation for the first performance in 1955 and so was able to edit the work in the light of that experience. I can imagine it must have been both exciting and daunting for the Hull Philharmonic Orchestra; this is far from simple music to bring off. Clearly Joubert wrote what he had in his mind with no concession for the performers involved. The very opening of the 2 nd movement – Lento ma non troppo - is a case in point. Funereal almost ritualistic outbursts accompanied by scurrying string figures give way to a sombre string elegy over grimly dissonant wind and brass chords. To sustain the tragic atmosphere here must have tested the Hull players to their limit. Again the stalking brass suggests Sibelius – but even here Joubert's voice is distinctly his own and Handley's pacing of the movement is perfection; the slow underlying tread not allowing the music to be becalmed. The transition into the 3rd movement Presto is so quick the movement is on us before we have time to catch breath. I would put money on the fact this was the movement to give most trouble to the Hull players! Every section of the orchestra has tricky anxious figurations that need to be knitted together in the complex whole. Credit again to the excellent LPO tossing off what by definition must have been totally unfamiliar to them. Glorious brass writing ensures the movement rattles along with the sustained energy of youth – perhaps something of Walton's Symphony No.1 and the cross-rhythms Walton delights in creeps in here but again the tight control of the material belies Joubert's – at the time – relative inexperience. I was interested to read that the powerful slow introduction to the last movement was an afterthought written between first performance and publication. Again, a steady but powerful underlying pulse gives the music an implacable march-like quality – an impression reinforced by flamboyant tattoos on the timps and quietly insistent pedal notes from the piano. There is a cumulative build in the tension which is suddenly – and somewhat unexpectedly - released by the arrival of the movement's allegro. Again, interesting to read that Joubert acknowledges in his note that the disparity in mood between the music from here to the end of the symphony and how it ‘caused some unease in the critic from The Times who covered its first performance'. Am I alone in suddenly hearing some Nielsen here? It has the flavour of that composer's Sinfonia Espansiva and it is at odds to the music that has come before. Perhaps it is the sudden juxtaposition rather than the sense of a long-fought fight for release that jars. But it is a minor quibble, what a pleasure to hear such an impressive work performed so well – I can only imagine that it was one of Joubert's best birthday presents! 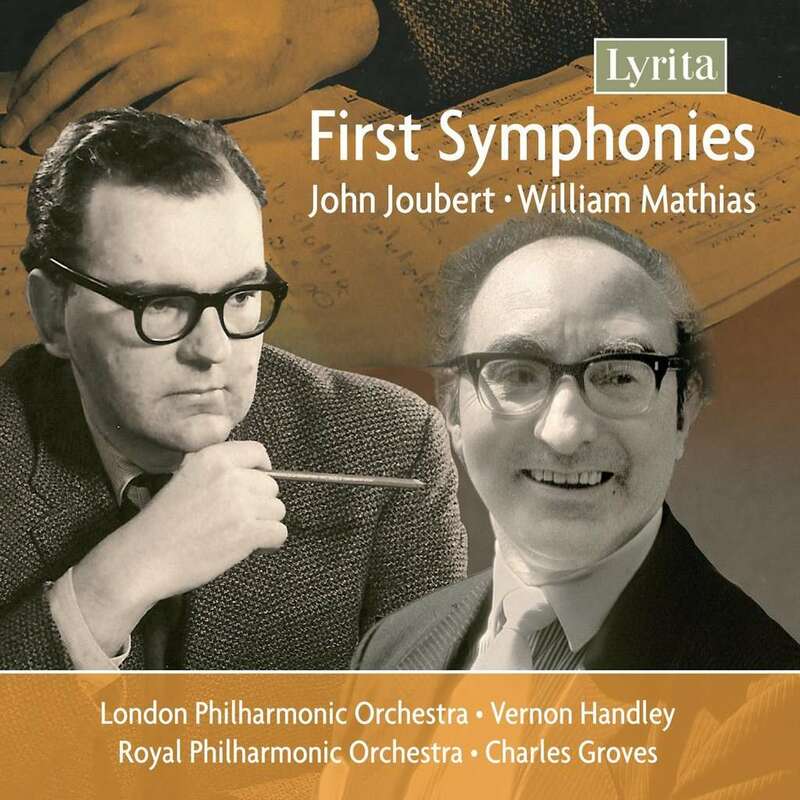 What a shame that Lyrita were not able to get Handley to record the 2 nd Symphony too before his untimely death in 2008. It is clear the pleasure is not mine alone – throughout this symphony the LPO play with superb virtuosity and audible pleasure in the writing. Also, Handley proves yet again what a marvellous and committed interpreter he was of British music. A word too for engineering and production – it is in the finest Lyrita traditions – to my ear still the source of some of the best sound let alone performance on any recording of British music – the ideal mix of richly detailed sound without ever becoming synthetic or overblown. One little curiosity though; the Lyrita website for the CD ‘single' version (SRCD322) lists the recording date as 2 March 1994 and the engineer as Simon Rhodes, the booklet for the current release has the same producer – Andrew Keener – but now it is from March 1995 with Tryggvi Tryggvason watching the meters! In either case it is superb – interesting how this recording team have been able to utilise/control the very resonant acoustic of Watford Town Hall to produce an ideal recording. I must admit I find some recent recordings there to be overly resonant thereby bloating the orchestral sound. Given that the well of ‘original' Lyrita recordings is now all but dry in re-release terms I am so glad to see them mining the back catalogue of other labels for recordings and performances worthy of resurrection. And Sir Charles Groves' performance of the Mathias Symphony No.1 is certainly worthy. My sense is that Groves' stature as a conductor is often overlooked or underestimated. Aside from his promotion of British music in recordings and in the concert hall it is worth remembering that he was the first British conductor to direct a complete cycle of the Mahler Symphonies and indeed the Liverpool Phil were the first orchestra to programme a cycle of the complete Shostakovich Symphonies (he did not conduct the complete cycle) during his directorship. In the field of British music his promotion of new music was astonishing and to this day recordings of his including Arnold, Bridge and Bliss have not been bettered. The recording here dates from just three years after the symphony's first performance in 1966. Another textual quirk here – the note says the work was commissioned by the 1968 Llandaff Festival but premiered there in 1966…! The liner for the competing version of the symphony on Nimbus also quotes 1965/6 for composition and 1 st performance so I assume that 1968 is a typo. No recording information is given for this work in the liner other than its original release on the Pye Virtuoso label. But it sounds very well – the close immediate, slightly unsubtle sound, suiting the bravura of the writing. As with the Joubert all credit to the orchestra and conductor for their uninhibited reading of the score. While not the technical equal of the Joubert recording – there is a touch of harshness at the biggest climaxes, and the internal orchestral balances are occasionally subject to highlighting – the performance conveys a great deal of the excitement and energy contained in the work. I do not remember Pye as a label ever sounding anything like as good as this on vinyl so credit to the Lyrita re-mastering engineers for the job they have done. This work is dominated by dancing figurations in the way that the Joubert was concerned with predominantly more dramatic issues. So while the passing dissonance level in this work is much the same as in the Joubert the prevailing mood is lighter and more exuberant. Try track 6 1:45 – I love the way the violas dig away with the accompanying motif, while the percussion and timps riff away and the violins play a flamboyant unison melody. There is a devil-may-care brilliance here that is exciting and arresting. This is in direct contrast to the Molto Adagio 3 rd movement which has a sense of stasis where the previous two movements emphasised motion. A flurry of bird-like motion in the woodwind (pointed up with a rather heavy-handed glockenspiel – percussion often finding out the limitations of older recordings) disturbs the stillness or perhaps awakens the orchestra to strive for a briefly achieved climax. The range of moods here is wider than Joubert is trying to express, this is the most consciously ‘atmospheric' music written on this disc. The brass led climax decorated with arpeggiating strings, piano, glockenspiel and harp. It has an almost heraldic quality but soon sinks back into the nature-music of the opening. But this heraldic quality re-emerges in the opening to the symphony's finale. The RPO brass clearly relishing the ringing writing – again stirringly caught by the recording. But this brief largamente introduction is soon overwhelmed by the allegro con brio and energy of overlapping dancing rhythms is re-established. Mathias is particularly adept at blurring the bar-lines – without access to a score I have no idea how or where they occur in this work instead there is a strong feeling for smaller rhythmic units which break down conventional pulse and allow the music to become a riot of interlocking cells and polyrhythms. Try 6:40 into the final track 8 – there's a touch of Hindemith's Mathis der Maler with a brass chorale overlying running string and woodwind figurations which builds to a powerful if slightly abrupt climax. Both works deserve to be heard live in concert but in the meantime this CD does them both honour. The Joubert is unchallenged but the Mathias has considerable opposition in the composer's own recording on Nimbus with the (then) BBC Welsh SO. Although movement timings are reasonably similar the feeling of the Nimbus performance – aided in part but the recording – is far mellower. Also, the 1970 RPO - the strings in particular - is a more virtuosic ensemble than the 1990 Welsh. Groves seems able to maintain the driving dancing momentum better than Mathias and the less subtle recording helps that impression too. Conversely the third movement benefits from the mellower sound on Nimbus. Ultimately they are two very different takes on the same work and if I prefer the Groves it is because I have a penchant for the up-front vigour and vim it captures – this is a young man's music and the spirit of that is well caught by Groves. Mathias's own recording was made just two years before his own tragically early death and that spirit is not nearly so present.